Welcome to w.o.d.welder, the home of hand-repairing skincare for athletes. We're passionate about helping your calluses so that you can get the best workout possible. Speaking from personal experience, we know that sore hands and torn skin can be a real hindrance to progress; our aim is to eliminate this problem with specialized hand care for athletes. Torn Hands - that's how we got started. We started w.o.d.welder as a result of being fed up with our own torn hands. Every time after an intense few days of workouts, our hands were torn to pieces, which made us frustrated and prevented us from completing our workouts. In an effort to try and fix our ripped hands, we sampled a traditional salve from a local company. Once we realized that our skin was mending overnight, we asked them to work on a custom version specifically for athletes. Thank you so much for taking the time to browse our products – we really hope they can help you push on with your workouts no matter how hard you work. Hand injuries can start to become a thing of the past as we begin to make your fitness routines more enjoyable and safe. We are athletes through and through; heart and mind. We work hard every day to make our hand repair cream and skin products better and stronger (like we do our muscles too!) and filter this philosophy into our company and hand repair products. We’re all about athlete skincare here and each one of our products reflects our dedication to helping your skin heal. Browse through w.o.d.welder’s innovative and unique hand repair products to find your savior. Our aim is to bring your skin back to health every time, no matter how hard you work out or for how long. Shop now! W.O.D. Welder Solid Salve - A stick of this stuff, applied frequently, helps keep the hands moisturized better than water based lotions while also working as an anti-bacterial and repairing existing rips and tears. The salve’s all natural ingredients include Lanolin, beeswax, aloe butter, shea butter, peppermint and eucalyptus. Natural Pumice Stone - The best way to prevent shredded hands in the gym is to maintain smooth, uniform palms outside of it. W.O.D. Welder’s wild volcanic pumice stones are harvested in California and more abrasive than the ones you tend to find in a drug store—making them ideal for smoothing out calluses and dry skin in your spare time. Hands as Rx Cream - Finally, the daily use of this unique skin cream will ensure your hands maintain their hydration and elasticity without breaking down the controlled calluses you need to get your work in. 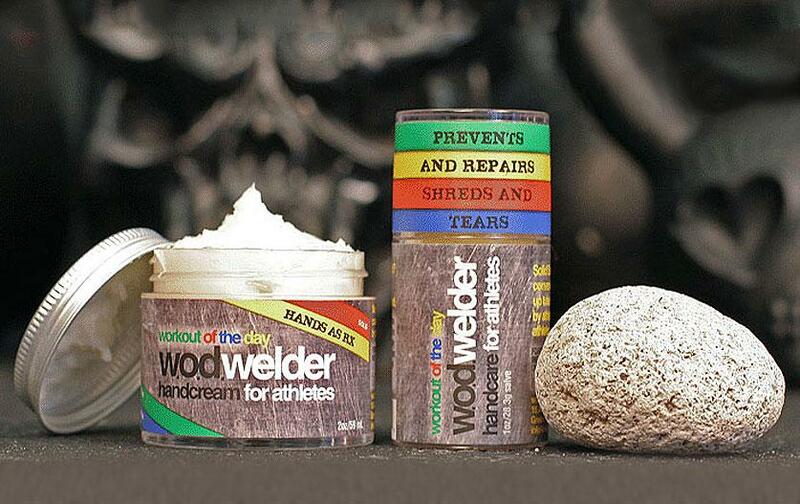 The W.O.D Welder Hand Care Kit is the ideal product for hands damaged from working out. It helps maintain good calluses, aids against tearing, takes the sting out of rips and speeds up recovery. Nearly every gym and fitness enthusiast has had calluses and torn skin. Calluses forming on your hands or feet is an inevitable part of training. Unfortunately, calluses can sometimes tear causing terrible pain. It makes working out much more difficult and in some cases the time in the gym has to be postponed until your hands have a chance to heal. If you get hand rips from exercise, then W.O.D Welder is the remedy for you. It takes the sting out of a rip instantly, so you can quickly get back to training. Simply apply to affected area soon after a rip occurs and every night before bed until healed. Keeping the affected area moisturized with the RX Cream will get you back on your exercise routine in no time. Lets just start by saying ripping your calluses open is super painful. I am a full time nurse so washing my hands with antibacterial soap is a constant and painful dilemma, during my twelve-hour shift. It is also hazardous for myself with all the germs I am exposed to during this time. Finding a solution to this problem was a must. WOD Welder is a multi step system that repairs, smoothens, and maintains the skin. The best thing for ripped hands is the solid salve balm. This is hyper hydration and the thickness allows it to stay on the skin to create the best environment for the skin to heal. If you are just dealing with callus build up and prevention of tears, using the black stone and lotion regularly is your best bet. The stone is used to keep your hands even and smooth. Having large callous creates a direct pressure point on the bar that receives all the friction causing them to rip. When worked down to a flat state your hands are still tough and strong but a lot less likely to rip. Using the lotion daily aids in keeping your hands hydrated. When skin gets dry it tends to crack and tear easier. Overall I have used this product for 4 weeks and found it to have a great improvement on the health and integrity of my hands. I no longer have sharp jagged mountain callous that bleed and tear. This is definitely a good product for people who struggle with their hands tearing.